I know, it's been a while since my last blog update. We celebrated Penny's birthday this weekend and I have posted some pictures of the party. Haylee couldn't make the party but she is coming to visit this weekend and we are looking forward to having our little princess. Yay! Blew out all the candles! Teegan and Penny sharing a joke. He's such a happy little guy. Tyce getting a horsey ride from Poppy. Check out the do - rag! Cameron ran the Tri in the Pines triathlon this weekend and we went out to cheer him on. He came in 2nd in his age group, about 6 minutes ahead of the next guy. He would like to have finished faster but we all thought he did great. The firemen let Tyce and Haylee play in their ATV while they waited for Cameron to cross the finish line. This little pricess is always all about the fashion. Here she is looking cool in her shades. These two were inseperable all weekend. They are best buddies. Didn't get many pictures of Teegan aka "Lunch Box" this weekend cuz he's still tool little to get out much. We had a blast with all the kids and they love seeing each other and playing together. My parents are here from Texas and they got to see all of their great grandkids so that was a lot of fun for them. Next up is Teegan's blessing. Tyce just adores his new little brother and gave him lots of loves and kisses. Here's me and Tyce with our new arrival - Teegan Kelty Whiting. Showing Poppy where his nose is. More of the proud grandparents. Teegan is 6lb. 15oz. and 20 inches long. We took a trip up to Greens Peak last weekend and did a little camping. Here is the face of a happy little camper after an afternoon trip into Greer for ice cream. This is a beaver dam on the creek at Sheeps Crossing. Tyce thought this place was pretty cool and enjoyed throwing rocks and sticks in the water. Here"s the women fixing foil dinners, Kendall followed it up with a dutch oven cobbler. This was a happy little camper all weekend. You can't beat acres of dirt, rocks, sticks and bugs. 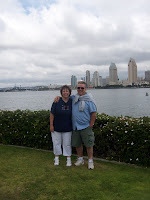 I thought I would put up some more pictures from our most excellent trip to San Diego. This is proff we were there! Hangin' out on the sun deck looking out toward Point Loma. Me and the Penster on break from our bike ride. 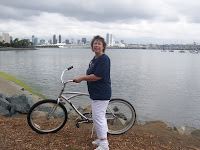 We rode bikes from one end of Coronado to the other. It was one of our favorite parts of the trip. 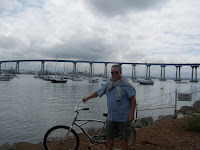 There is a paved bike path that goes clear around Coronado and it's a real easy ride. Penny wanted to get the bike in the picture as proof she really rode around the town. This park has a great view of the city in the background. 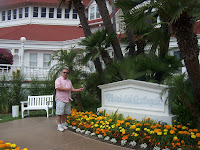 Penny and I are in San Diego staying at the Hotel Del Coronado on Coronado Island. This is an old historic hotel that was built in 1888. The movie Some Like It Hot with Marilyn Monroe and Tony Curtis was filmed here. 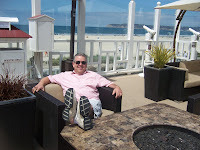 We have always thought Coronado Beach was the best beach in the area and the hotel backs right up to it. Here Penny and I are on the beach in front of the hotel. It was a little breezy and cool today but still really nice. These are picture of the hotel - this is the bedroom in our suite. The view from the balcony overlooking the garden. The red tree down there is the biggest bouganvilla I have ever seen. This is the front of the hotel, it's pretty impressive. I have some more stuff that I will post later. Right now it's time to grab some frozen yogurt and sit on the sun deck in front of the fire to watch the sun set. Yeah, that's pretty cool. We are Sean & Penny Comerford. We have been married for 28 years and have two grown children, Cameron 27 and April 25. Cameron is married to Bethany and they have the most beautiful little girl in the world - Haylee 8 months. April is married to Kendall and they have the most beautiful little boy in the world - Tyce 1 year. We are enjoying being grandparents and love spending time with our family. I am a Real Estate Appraiser and Penny works with me. Kendall also works with us and has just finished his apprenticeship. Cameron is an appraiser in Mesa and just got his pilots license. We are very proud of our kids and take full credit for how good they turned out. We are in the process of building a house in Show Low. This is the first house we have built in our nearly 29 years of marriage so we will see if we can make it to 30!